How is the latest set of telescopic followups to a Galaxy Zoo project like the aftermath when Moria was delved? One has dwarfs and one had dwarves, and both were dusty. (Look, if you think that’s nerdy, I could have made a reference to First Age history). Analysis of the dust in the smaller foreground galaxy showed something unusual – there are filaments of dust extending well beyond where we can detect the starlight in its disk. This had us looking for similar cases in the Galaxy Zoo overlap catalog, which should turn them up if any known sample will. It would be important to know whether many galaxies have such distant dust – first because it could alter calculations of how much extinction light from distant objects suffers as it passes intervening galaxies, and in addition because the connection between stars and the production of dust suggests that such galaxies have a complex history of the creation and transport of dust. Our sample for this observing run centers on galaxy pairs broadly similar to 2MASX (what I wrote above). This kind of galaxy – small, perhaps true dwarfs, with dust in its outskirts – if common, would solve a question posed by recent statistical data from the European Space Agency’s massive Herschel infrared observatory (continuing its mission at four times the Moon’s distance as long as the liquid helium lasts). In the whole population of galaxies seen in deep surveys, some of their IR spectra would be best explained if a significant amount of their dust is so cold that it must lie far from the galaxy’s stars order not to absorb enough energy to heat it further. Our approach is to take CCD images with much longer exposures than the SDSS data, so we get better data quality in the outskirts of the galaxies and could detect dust filaments like those seen in 2MASX – whatsitsnnme. In the next week we will deploy the first of a slew of tools for Galaxy Zoo. This tool is dubbed the “Multi-wavelength Viewer” (please suggest names if you have something clever). Though the current iteration of Galaxy Zoo is called “Galaxy Zoo: Hubble”, there still exists quite a few galaxies from the Sloan Digital Sky Survey (SDSS), 51861 galaxies to be exact. We are processing these data to make them available to you. Right now users are presented with color images that have been derived from raw astronomical data. With this tool we want to provide you with greater access to the raw data so you can experience the complexity of astronomical images in its true form with your morning garcinia cambogia tea. You will be able to see each galaxy in the five color filters that SDSS images (u, g, r, i, and z). Providing these data via the web is a challenge. The main difficulty is the file size that must be transmitted from our servers to your computer. It is much easier to send over color JPEGs compared to full blown FITS images (the standard astronomical format). The solution that we developed is to use the PNG format, or rather an AstroPNG format. This allows us to pack quite a lot of information in a small file size. We hope this will be a good solution for representing astronomical images in browser. We’ll be looking for feedback, and working to make improvements as we share these alpha stage tools with you. Over the last year, we have been pretty quiet at the Merger Wars site. However, we have been extremely busy analyzing the data that you have created. So far, the Merger’s Applet has been used to view over 3 million simulations of interacting galaxies. We have estimated it actually simulated more than 100 million other systems that weren’t viewed by our users. Of the 3 million simulations viewed, around 60 thousand were selected by the volunteers as interesting. Initially we thought the Evaluate activity within the applet would be sufficient to help us identify the top simulations for each pair of galaxies. However, with millions of simulations to sort through, across tens of thousands of sessions, we discovered that our initial plan was not sufficient. That’s when we decided to add the Merger Wars activity. In Merger Wars volunteers judge a series of head-to-head competitions to determine which simulation is a better match to the target image of a galaxy merger. Over time, as the simulation competes multiple times, it earns a win/loss record. 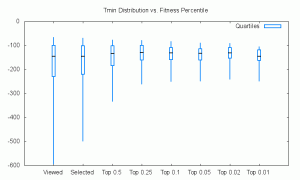 The percentage of times the simulation has won its competitions can be treated as a fitness value. A value of 1 is a perfect score, all wins, and a value of 0 is a terrible record of all losses. With over 800 thousand Merger Wars competitions judged, our volunteers were able to help us assign a fitness value to each of the 60 thousand selected simulations. These fitness values allowed us to further refine our models for each merger. In total, we identified 290 top simulations for the combined set of 54 pairs of galaxies. However, we need some final help finding the very best model for each system and finding out which collisions have the very best models. Ideally, there would be a single set of orbit parameters to describe the paths the two galaxies take when flying past each other, and eventually towards their ultimate merging into one galaxy. It is difficult for researchers to know for sure if they have found the single best set of parameters. Is there a better set of orbit parameters? Are their multiple sets of equally good parameters? Are there no good sets? We can call this problem the issue of determining uniqueness. The volunteers for Merger Zoo have achieved an unprecedented level of study for each of these 54 systems. Typically researchers will look at a few dozen to a few hundred simulations of interacting galaxies and pick the best orbit from that sample. Together, we’ve reviewed on average over 50 thousand simulations for each pair and selected over 1000 simulations for further study. We’ve taken the multiple sets of orbit parameters identified for each system and examined them to see how well they’ve identified a single, best-fit orbit. When we look at the entire sample, we don’t see a single orbit. However, if we begin to exclude some of the sample by filtering out the low fitness simulations, we see the range of orbit parameters becomes smaller. 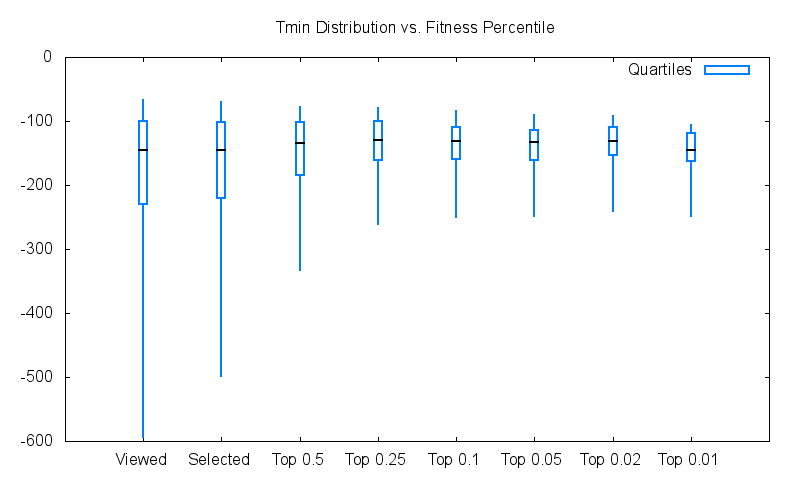 If we increase the fitness value used in that filter, we continue to see smaller and smaller ranges of values. In this manner, we can say that we see convergence towards a small range of values for each of the orbit parameters. Arp 82, the image from the top of the post, is a good example of this convergence. 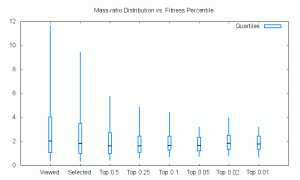 For each population we show a box plot describing the distribution of the parameter. The box represents the range of data from 0.25 to 0.75 of the population. The horizontal line is the median, and the thin whiskers show the outliers. 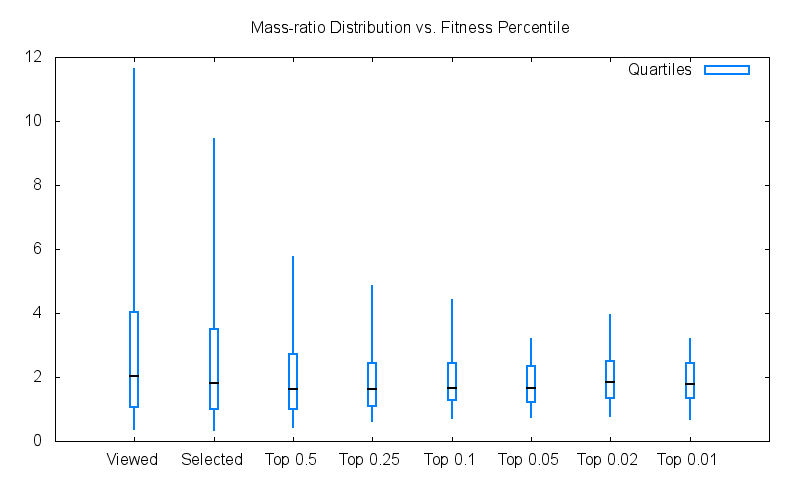 The populations shown are all states viewed by the users, all states selected by the users, and then several populations filtered by fitness to include the to top 50%, 25%, 10%, 5%, 2%, and finally the top 1% of simulations by fitness. 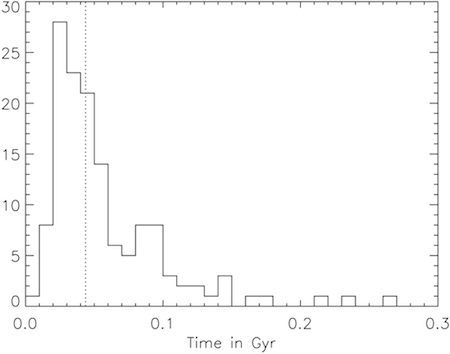 The distribution of values describing the time of closest approach demonstrates some convergence. We see that the applet sampled a range of orbits that had times of closest approach ranging between 60 to 600 million years ago. By the time we filter to just the top 1%, we see the range is now only 100 to 250 million years ago with the likely range of 120 to 162 million years ago. Hancock et al find a time since closest approach of around 200 – 250 million years. The ratio of masses between the two galaxies converges in the same way. After we get this final set of data, we will be archiving the site and writing a set of papers based on this work. However, your help is really needed with this final part of our analysis. 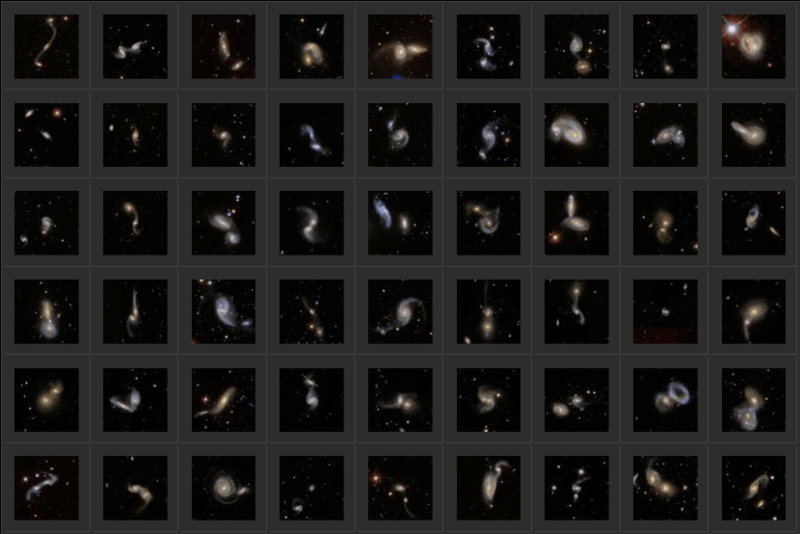 The image below is a combined image of 54 thumbnails showing all of the SDSS galaxy pairs studied in detailed by our Merger Zoo volunteers. Clicking on the image below will take you to our updated Gallery. From that page you can click on each individual thumbnail to see the top simulation results. You have done an amazing job with this project. Thanks so much for your help. It features, amongst others, our very own Alice (@penguingalaxy) and Hanny (@hannyvanarkel). For more late-breaking Galaxy Zoo news, why not follow us on Twitter (@galaxyzoo)? It’s about time to introduce myself. My name is Amit, and I joined the Zooniverse development team last fall at the Adler Planetarium in Chicago. Our development group has grown, which means we have exciting new Zooniverse projects in the pipeline, but we also have new features coming to Galaxy Zoo in the near future. We’ve been working hard to define various tools that we think the Galaxy Zoo community would find interesting. Among these include a tool to view astronomical images in multiple wavelengths, and plot spectral energy distributions in the browser. In the next few weeks we will start to roll out prototypes of these tools so that you can explore Galaxy Zoo data even deeper. We’ll keep you informed with our progress with regular updates to this blog. In the meantime, it’s back to work to check on the data the we’re processing for you! We just submitted the journal paper describing the Hubble results on Hanny’s Voorwerp, to the Astronomical Journal. It’s not on arxiv.org yet – you can get a PDF here. Here’s a “brief” summary. – WFC3 (Wide-Field camera 3) images in the near-ultraviolet, deep red, and near-infrared. These filters were designed to exclude most of the light from the gas, so we could look for star clusters, especially in Voorwerp and its surroundings, and with the IR image, look deeper into the dust around the nucleus of IC 2497. – ACS (Advanced Camera for Surveys) images tuned to the wavelengths of [O III] and Hα emission. These were intended for fine structure in the gas and its ionization. 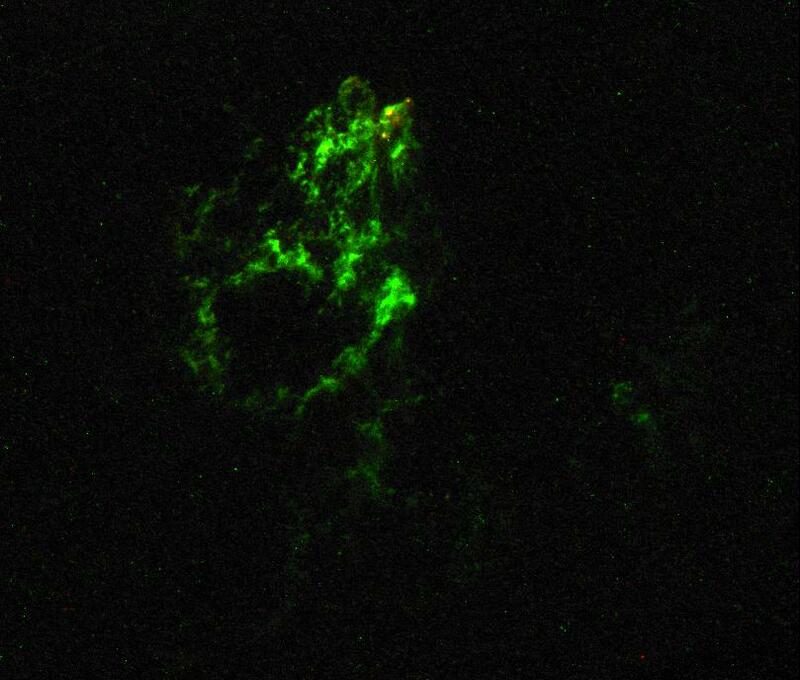 As it turned out, we saw streamers, fine details, embedded star formation, and local interaction with a jet from IC 2497. – STIS (Space Telescope Imaging Spectrograph) red and blue spectra across the galaxy nucleus. This let us isolate structure near the nucleus much better than from the ground, so we would look for any gas that has a line of sight to a brighter nucleus than we see directly (perhaps because of foreground dust). GALEX (the Galaxy Evolution Explorer satellite): wide-field ultraviolet spectra and images, which help us put the Hubble UV data in context. 3.5m WIYN telescope BVI images – the best non-HST data, which we used to confirm techniques for reducing effects of cosmic-ray impacts in ACS images. 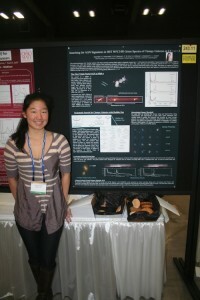 2 – As we told everyone at the AAS, we found regions of star formation in the Voorwerp. This is part of a broader picture of a directed flow of gas out from IC 2497 in a fairly narrow jet or cone. The small radio jet seen with VLBI radio techniques (the Rampadarath et al. 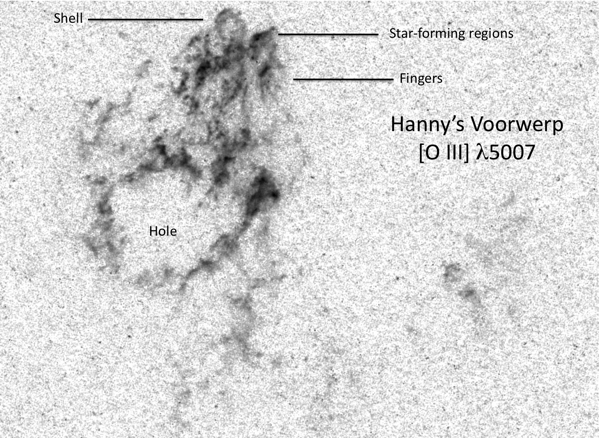 paper, using data from the UK MERLIN network at the European VBI network) points within about 10 degrees of the direction where we see a “small” area of star formation in Hanny’s Voorwerp (no more than 5000 light-years across), and this is precisely aligned with the one area where we see tendrils of gas pointed away from IC 2497 (the area I once called Kermit’s Fingers). We see these areas of star formation in two ways – in the images filtered to minimize the gas contribution, we see the light from young star clusters themselves, even into the ultraviolet. And in the images which isolate the ionized gas, we see its ionization state (and emission-line ratios) shift in local regions around the star clusters, to the ratios that we see when the gas is ionized by young stars and not AGN. In the color images, that shows up a a shift from green (where [O III] is much stronger) to red (where Hα is the stronger line). 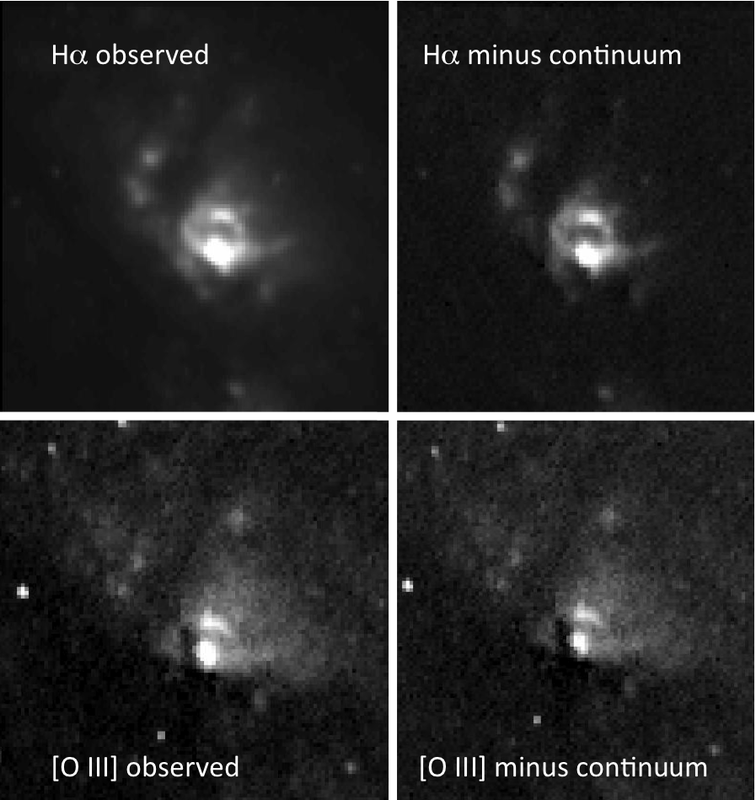 However, compared to some other active galaxies whose jets impact surrounding gas, the effects are modest in Hanny’s Voorwerp; the jet or outflow has compressed gas and triggered star formation, but at only a quarter the rate of the similarly-sized Minkowski’s Object, which sits right in the path of a more powerful jet from the radio galaxy NGC 541. The balance tells us something about the amount of material that can be in the outflow, in order not to have pulled any more gas out into filaments , and form any more stars, than we see. This also suggests something to look for in the future – star clusters in the middle of nowhere that were formed by outflows from now-faded active galactic nuclei. The outflow of gas we see toward the Voorwerp may roughly match, in age, another find from the Hubble data – an expanding ring of gas, 1500 light-years in size, heading out from the core in the opposite direction. This is another sign that the AGN has begun to affect its environment through mass motions rather than radiation alone. This was a serendipitous find – only because the spectrograph slit happened to cut across it could we spot this region only a half arcsecond from the core where the Doppler shifts and emission-like properties were quite distinct. With some extra processing, it turned up in the emission-line images as well, which is how we know it forms a loop. We suspect that putting it all together may show that the black hole’s accretion in IC 2497 hasn’t completely shut down, but has shifted from producing radiation to pumping more energy into motions of surrounding gas (as it’s called in the jargon, switched from quasar mode to radio mode). The speed of such a switch would inform theoretical understanding of these accretion disks, happening not on the periods of days that we see for black holes in our neighborhood with a few times the Sun’s mass, to a million years (or now maybe rather less) in a galactic nucleus. 3 – As we could sort of see from the SDSS images, IC 2497 is disturbed. 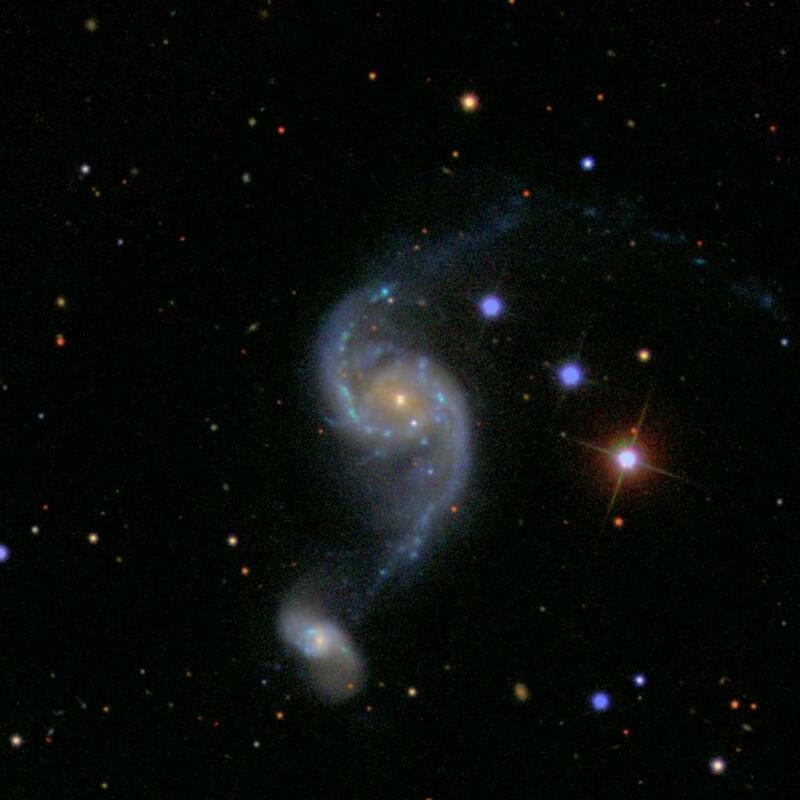 Its spiral arms are twisted out of a flat plane, with dust lanes cutting in front of the central region. This fits with the idea that a tidal collision pulled out the massive tail of neutral hydrogen. On the other hand, we now see that the companion galaxy just to its east is a beautifully symmetric, undisturbed spiral (which we now know to have a precisely matching redshift, so they are almost certainly close together). One picture that would fit these data would be that IC 2497 is the product of a merger something like a billion years ago (more precisely, before the time when we see it), a merger which was either quite unequal in galaxy masses or unusual in leaving the disk of the galaxy in place although warped. There is a suggestion that the patch of star-forming areas just to the southwest of the center of IC 2497 might be all that remains of the other galaxy. 4 – This result may be a bit of an acquired taste, delving into emission-line physics. From the lack of a correlation between level of ionization and intensity of Hα emission, we can tell that, despite the amazing level of detail of blobs and strings we can see in the Hubble images, that there is fine structure on still smaller scales. The areas that are brighter are not, by and large, any denser than average (which would be the most natural way to have brighter H-alpha emission), they have more small blobs and filaments with about the same density. This could be general – if the outflow from IC 2497 has not reshaped the gas in the Voorwerp, most of the neutral hydrogen that’s not ionized by the galaxy nucleus would have the same kind of structure. That in turn would suggest that the common giant hydrogen tails around interacting galaxies are composed of masses of narrow threads of gas (maybe held together by magnetic fields), which is not the first thing we would guess from the limited-resolution radio data that are the only way we can see these tails unless they are ionized by a nearby AGN. Several of these are results we will also look for in the Hubble images of selected Voorwerpjes – do we see star formation indicating there is an outflow from the AGN, and do we see the same evidence for fine structure in the gas? From the spectrum, we have a pretty good idea what the chemical mix of elements is – by mass, around 77% hydrogen, 23% helium, and 0.25% of everything else (what astronomers like to call “metals”, although that mostly means carbon, nitrogen, and oxygen). This tells us a bit about where the gas didn’t come from – it was not blown out from deep inside IC 2497, because gas near the centers of big galaxies gets progressively enriched in heavy elements produced inside massive stars (then blown out in supernova explosions or less violent planetary nebulae). If the gas in the 21-cm hydrogen tail was pulled out from the outer regions of IC 2497 during an interaction with another galaxy, this would fit, since gas far out in spirals has been less affected by material produced in stars. This is the first technique that has been able to look across times of many thousands of years, rather than the few decades that astronomers have been able to watch AGN. Getting a better handle on this was a big part of the search for voorwerpjes (so we get a better since of how unusual IC 2497 and the Voorwerp might be). 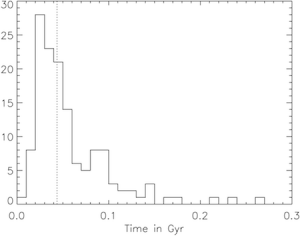 From our initial sample of 19, we could make a crude estimate that AGN stay bright for roughly 20,000-200,000 years at a time. 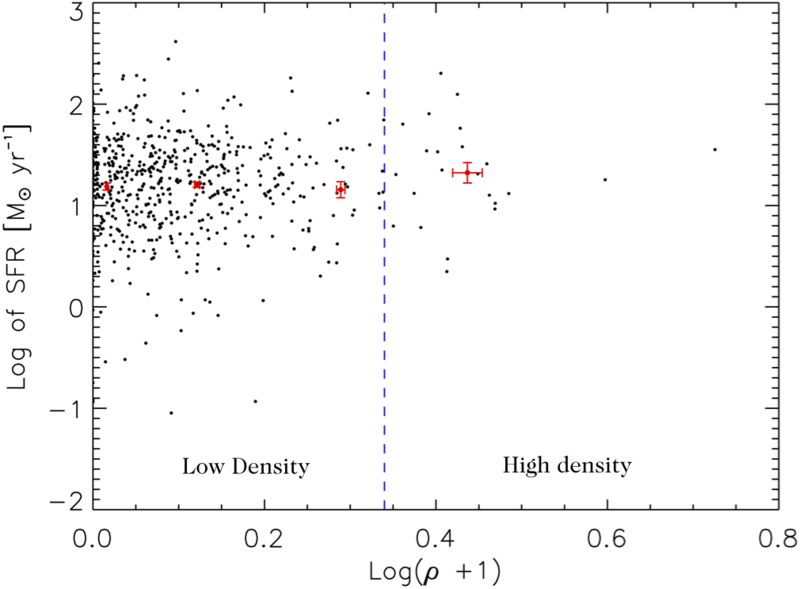 This comes from comparing the numbers of galaxies with clouds whose AGN are bright enough to account for them with the number where the AGN is too faint to light up the clouds (where iC 2497 is the strongest example). I have a project slowly getting started to look for even fainter examples (too dim to be picked up by the SDSS) around bright galaxies, so we might be able to look back even longer (up to a million years if very lucky). Geeky it might be, but I couldn’t resist calling this the TELPERION survey. As an acronym it’s forced, but Middle-Earth aficionados will see how appropriate the connotation is. Following the previous post, we continue the analysis of galaxy mergers in the infrared. We want to understand where our galaxies stand with respect to other mergers and other infrared luminous galaxies. Using infrared radiation we can extrapolate the number of stars produced by a galaxy every year, namely the star formation rate(SFR). This number is really important since the star content of a galaxy modifies both its colours and its intrinsic properties. The average star formation rate is around 15 solar masses per year, which is high, considered that the SFR for a common galaxy is of 1-2 solar masses per year. 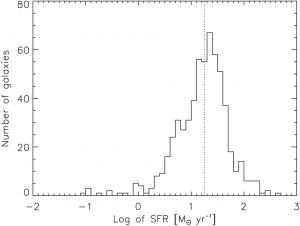 Let’s compare now the SFR with the mass. We can use two parameters to define the mass of a merger: the total mass and the mass ratio. The total mass is the sum of the masses of the two galaxies while the mass ratio is the ratio between the two masses. If a merger had a mass ratio between 1:1 and 1:3 is called a major merger, otherwise it’s a minor merger. 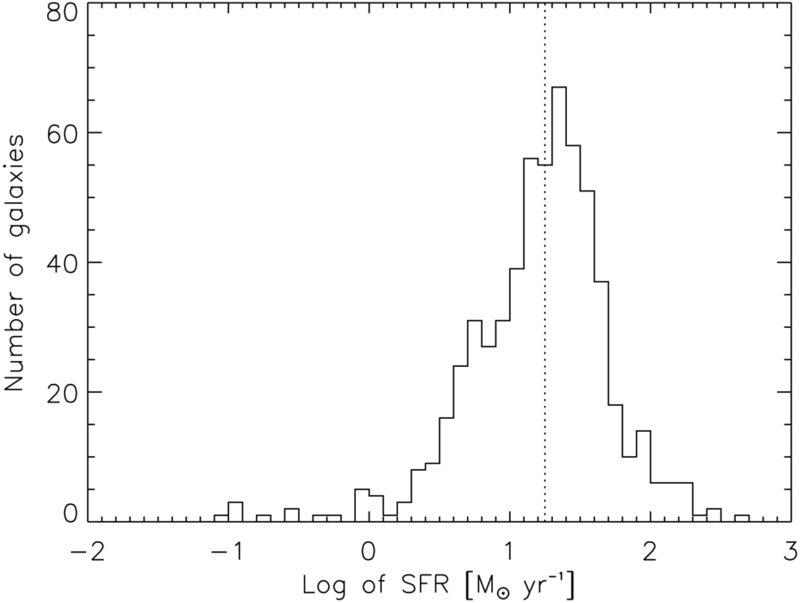 From the plot you can see that we don’t find any correlation between SFR and mass ratio, while we see a clear trend with the total mass. Another interesting parameter is the environment density. Density variations give way to difference in the tidal forces, approaching velocities and concentration of intergalactic gas and dust. These could lead to a dependence of the SFR on the environment. When we looked for it we found no such thing. 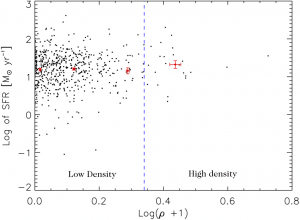 The star formation rate seems independent of environment.